The game of Twenty-Eight is quite similar to many trick-taking games, except bids are made and trump is chosen with only a portion of your hand dealt to you. Once both are settled, you are dealt the rest of your hand and the game proceeds with your standard trick-taking mechanics in place. However, when trump is chosen, it is done silently and only revealed when one of the players is unable to follow suit. In the game of Twenty-Eight, it is completely possible to be playing trump without even knowing it, so use your discretion on how you’d like to play your hand. Determine teams by having partners sit on opposite sides of the table from one another. This game is for four players. Reduce the size of your deck by removing the 2 through the 6 of each suit. For the game of Twenty-Eight, you’ll be using a deck of only 32 cards—J, 9, A, K, Q, 10, 8 and 7 in ranking order. Deal out the deck until each player has a total of four cards in her hand. Typically, standard dealing mechanics are used in Twenty-Eight—cards are dealt to each player one at a time—but feel free to use increments of two to expedite the deal. The remaining cards are set aside and used later in the game. Bid your hand for the opportunity to call trump, starting with the player to the left of the dealer and moving around the table in a clockwise direction. Since you are playing in teams of two, your bid will be based not only on your hand, but what you think your partner will bring to the table if you win the chance to call trump. Bids start at 14 and move on up to a maximum bid of 28 (the total points available in a given hand). Subsequent bids may be either a pass or a raise in points. Choose trump if you have the highest bid at the table. However, you will not announce the suit in which you wish to make trump, it is called by placing a card of that suit from your hand face down in front of you. Deal out an additional four cards to each player, bringing each hand up to a total of eight cards. Lay a card, starting with the person to the left of the dealer. Follow suit when possible. Highest suited card takes the trick. If you are unable to follow suit, ask for trump to be revealed. Once revealed, either throw off or play trump. Highest trump card takes the trick. In both scenarios, the winner of the trick leads the next card. 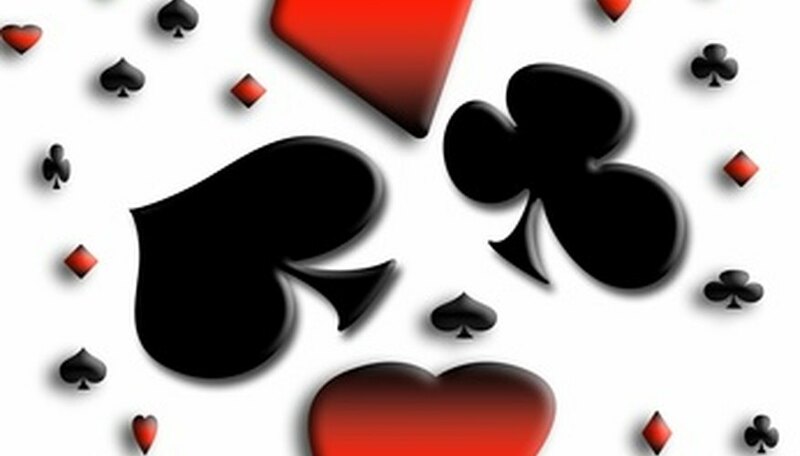 Continue to play until all tricks have been taken and no cards remain in any player’s hand. Tabulate the point cards within those tricks won. Not all cards are worth points, so your bid should have been based on your ability to win tricks which contain point cards. Point cards and their values are as follows—jacks are worth 3 points, 9s are worth 2 points and both aces and kings are worth 1 point. Earn 1 point to your overall team score if you and your partner were able to take at least the number of bids you called when you were the highest bidder. Earn 2 points to your overall score if you were able to keep the highest bidding team from taking its bid points. Win the game of Twenty-Eight by being the first team to accrue 10 points total. To determine the order of play for the game of Twenty-Eight, deal out the cards face up until one player is dealt a jack. This player acts as the first dealer. Bidding and play moves to his left in a clockwise direction around the table. Subsequent deals follow this same path. Since you must lay down a card to call trump, the option of no trump is unavailable for the game of Twenty-Eight.